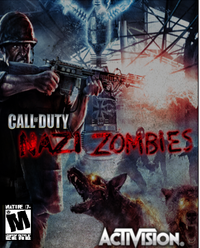 Nazi Zombies is a mini-game originally released in Call of Duty: World at War. The point of the game is to kill all of the zombies in sight (or die, most likely die), while also attempting to delve deeper into a complex background. 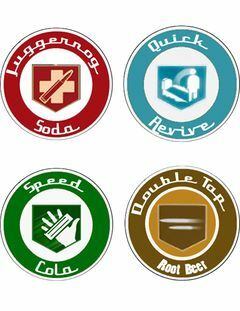 To aid in the killing of these "zombies" (and the activation of the power), power-ups and extra weapons are provided for a "slight fee." 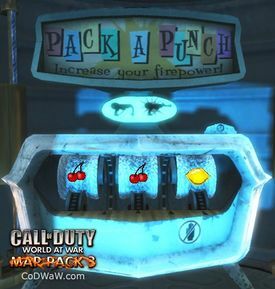 This mini game has become very popular amongst the Call of Duty community and is expected to stay that way for years to come. 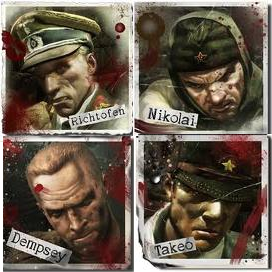 The origin of the zombies is widely known and agreed to be the fault of Dr. Ludwig Maxis, Edward Richtofen and a faulty teleporter. Zombies were being spawned from the corpses of those who had volunteered to be test subjects of the teleporter (the volunteers were most likely vagrants and random homeless people because the Nazis detested the homeless, and found great use for gassing them or using them as playthings). The test subjects were either severely gibbed, as heard from a radio transmission in Der Riese, or sent through the mainframe, leaving them in some God-Forsaken place near the plant, which caused spawning points for the zombies. Not even turning on the electricity can prevent that, even though it does solve most problems if the player isn't already being swarmed by flies zombies. As the experiments progressed, the corpses began to reanimate in a rather strange fashion that was described by Richtofen as a "Damn weird death twitch", and Dr. Maxis was dumbfounded with that statement. 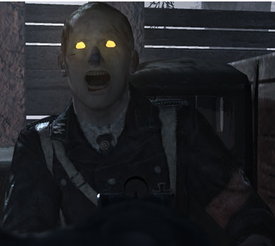 He didn't know whether to kill the zombies, let Richtofen eat them, or control them. So, he did the latter. That turned out to be a worse idea than letting Richtofen eat them. The zombies proved stubborn, and had to be killed. Through the course of several tests (and various killings and maulings), the teleporter seemed stable, but the test subjects disappeared when teleported. Hellhounds then came into the blood-stained picture. Dr. Richtofen, a little more paranoid and unstable than normal, goes along with another teleportation experiment and fetches Fluffy, Samantha Maxis's dog. Richtofen placed the dog into the teleporter, the teleporter made a noise, and the dog disappeared. A few seconds later, the teleporter door shuts, and electricity balls up in the teleporter, and growling can be heard. Richtofen, in a burst of insanity, locks Ludwig and Samantha in the same room as the dog. Screams can be heard, and the transmission ends. 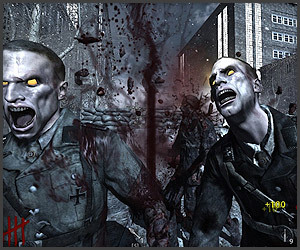 In a later transmission, Maxis can be heard committing suicide out of depression over the loss of his daughter as zombies raze the Der Riese project. 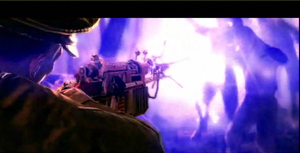 The zombies eventually went dormant, but were awoken by Samantha to completely and utterly destroy Richtofen's delusional fantasy of controlling the zombies himself. Tank Dempsey is the pumped-up stereotype of a U.S. Marine war hero. He tends to have a very cocky personality when it comes to killing zombies, but is overall very stupid, often taking insults from Dr. Richtofen without taking notice. He also cannot pronounce Wunderwaffe (vʊndɐˌvafə), but he insists on saying "Wonder Waffle", causing a great deal of pain to Dr. Richtofen, and causing everyone else who plays Nazi Zombies to pronounce it that way also. Dempsey also has a darker side, occasionally having morbid hallucinations of false glory, much like Dr. Richtofen. Nikolai's closet is literally full of skeletons, many of them with the flesh still attached. Before the war, Nikolai quickly made his way up through the party ranks by killing the next man in line , and by marrying the children of the politically important. Nikolai’s bloody and morbid reputation spread quickly through Russia, and the government hated him for it. As soon as the war started, Nikolai was dropped at the front line and forgotten about, where he wallowed in self pity, vodka, bullets (and more vodka) for several years on end. He apparently hates Takeo and Richtofen, and often openly exclaims it. However, he seemingly respects Dempsey and they are often able to converse without Nikolai breaking out into a seething rage (a rare case within itself), which doesn't seem like normal behavior for Nikolai because he is always drunk beyond the point of coherence. Captain Takeo Masaki (Japanese: まさき たけお) is an Imperial Japanese Soldier As a descendant of a long line of samurai, Takeo is destined to turn on the power bring his family honor through bloodshed his service in the Imperial Japanese Army. He has an unhealthy, neurotic obsession with "honor," which is often applied to points and/or ammunition (as stated by the quote, "No ammo, no honor!") Takeo is also very susceptible to motion sickness, has he vomited after using a teleporter in "Call of the Dead" (that could be, however, blamed on the other members of the posse, as none of them have bathed in quite some time). Takeo openly supports his comrades, though he believes Dempsey to be "The Missing Link." Dr. Richtofen has always been the way he has (sadistic and crazy, possibly mentally retarded), even during the days of the Wiemar Republic when he was an amateur reconstructive surgeon for the wealthy aristocrats of Germany, until the Nazi party took control (he found the government, oddly enough, too "liberal"). He has a sadistic passion for killing zombies, people, animals, inanimate objects, and people that look like Dempsey, although he passionately refers to the zombies as his "minions", totally contradicting his reasons for killing them (Maybe it's out of love?). Dr. Richtofen is also the supposed inventor of the Wunderwaffe DG-2 (which has nothing to do with waffles or toasters), as evident by this quote, "Ah, the DG-2! One of my greatest inventions!" Richtofen cannot stand Dempsey and he "hates his ugly voice"; he also cannot stand the British (To Dempsey, who was opening fire on one of the undead, "You thought he was British, ja?"). He also seems to know the origin of most of the zombies and wunderwaffen (seeing that he helped create them with Dr. Ludwig Maxis before killing him). ~ Edward Richtofen on his attempts to make zombies fly. Teleporter: It's a teleporter; it needs not to be explained, for it implies that itself. Yet, the power must be restored to use it, rendering it useless until the power is turned on, and until the teleporter is linked to the mainframe. These hindrances render the entire concept useless, due to the over-complicated nature of the utility (and possibly the confounded abuse of wording in this sentence). This article was nominated to become a featured article; however, due to several votes being devoured by a Zaurask, it didn't make the cut (8/10.5). Don't let this happen again! For just pennies a day, you can prevent another travesty of this nature, or vote for other articles at Uncyclopedia:VFH.